Pete’s Cafe opened in October of 1949. It began as a small modest cafe located on First Street across from the Santa Fe Railroad. The cafe was furnished with two long counters, red vinyl topped stools and bright red vinyl booths for family seating. The menu consisted of a breakfast section, burgers and fries, and of course chile bowls. Owners of the cafe were a young couple by the name of Pete and Eligia Torres. As they worked to get the business off the ground, they were learning that it would take abundant energy, endless patience, and lots of hard work. They also learned that they would need help…good reliable help. They quickly hired a couple of family members to help with cleaning, prepping, cooking and dish washing. 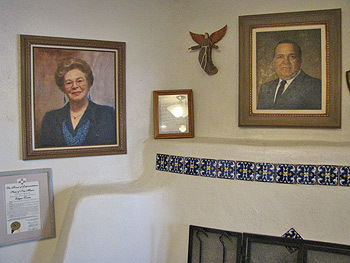 Almost for certain, this hard-working couple did not realize at the time, that they were in truth building a business that would eventually become well-known and loved throughout the state of New Mexico. By the mid 60’s, Pete’s had grown in size by an additional dining room and a larger kitchen. The number of employees had also increased. Pete’s was operating six days a week for approximately 8 hours a day, with hopes of achieving further growth. As Pete’s was gaining new customers, it became apparent to Pete and Eligia that they could increase the growth of the business by specializing in food they themselves were raised on, which, by the way, seemed to coincide with what customers were seeking. Namely…good ole beans, chile, and enchiladas, and so preparation of red and green chile became a daily task. Eligia followed her mother’s recipe, which is still the recipe that is used to this very day. Another practice that became a daily ritual was the cleaning, soaking, and cooking of the pinto beans. A simple cheese and onion filled enchilada plate became a favorite among customers. Bit by bit, business was growing and moving forward. In time, Pete’s began to transition into something much more than just a diner-type eatery. 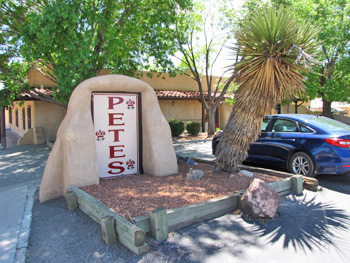 Pete’s began to draw the attention of the locals of Belen, Los Lunas, and surrounding areas. It was becoming known as a place where working people could gather during their lunch hour. It was known as a place where families could come to have a delicious and affordable lunch or supper or celebrate a special occasion. The menu featured numerous New Mexican food entrees such as oven-baked carne adovada, crispy and flavorful chile rellenos, and shredded beef enchiladas topped with red or green. As in the early days of preparation of the red and green chile, the trusty kitchen staff who prepared the chile decades later held steadfast to the commitment of keeping the taste authentic and consistent. To enhance the experience of a truly delicious meal, much care was given to insure that customers were greeted and served by a friendly and efficient serving staff. Newly added dining rooms at Pete’s Cafe took on a very cozy, comfortable, and esthetic look. Eligia had always had a great love and interest in art. She was now paying close attention to the decor of the dining rooms. She began collecting and displaying the art throughout the restaurant. Here, she thought, customers could relax, enjoy a perfect meal, and appreciate the beauty and charm of each dining room. 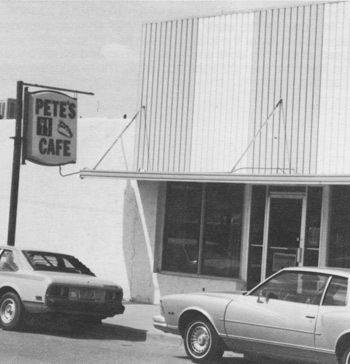 Today, Pete’s Cafe celebrates over 65 years of serving the community of Belen and its surrounding areas. We feel deeply graeful to our many patrons over the years. Today, the Torres family along with its dedicated staff continue to commit to serving the “real thing” – authentic chile, red or green, served over a choice of our New Mexican food entrees. Come and take part in the Torres tradition. Come and visit us at our historical location for a genuine New Mexican dining experience.